Located across the street from the historic Stone Jug, the Rorke Stores served as a major commercial centre for the town of Carbonear for 100 years. A view of the stores in 1998. [The store to the left blew down during a storm in 1999 – webmaster, 2016]. John Rorke was born in Ireland in 1807. He came to Newfoundland at age 17 to work as a clerk for a local firm run by his uncle. By age 23 he started his own business and married Mary Tocque, the daughter of another prominent local merchant. In the following years, Rorke and his family became successful merchants. Rorke established a fleet of ships for trading goods, fishing and sealing. The family also established a shipbuilding business and began trading with the West Indies and other foreign ports. Rorke also proved to be successful outside the business arena. He represented the District of Carbonear in the House of Assembly for 20 years, and in 1879 became a member of the Executive Council. On his retirement he had the title "Honourable" conferred upon him by Queen Victoria. Rorke passed away in 1896 and left the business to his sons. Disaster struck John Rorke's business in 1859 when fire destroyed much of Carbonear, including Rorke's business buildings and his residence. In 1860 they started construction on a new building that served as a centre for business and as a residence. First came the Stone Jug, which they built between 1860 and 1863. This building served as both residence and place of business for the family for several years. In the early 1870s, the family business expanded when they built two storehouses across the street. The west storehouse was known locally as "The Molasses Store" since it was where customers brought their molasses kegs to be filled. The store also sold cement, lime, iron, glass and other products. The east storehouse was used to store feeds, paints, flour, beef and pork. The top floors of both buildings were originally used as sailmakers' lofts. The east storehouse burned down in 1917, but it was quickly rebuilt. Both stores remained in use until 1978, when the Rorkes ceased operations, ending 140 years of service to the people of Carbonear. The family donated the storehouses to the town. 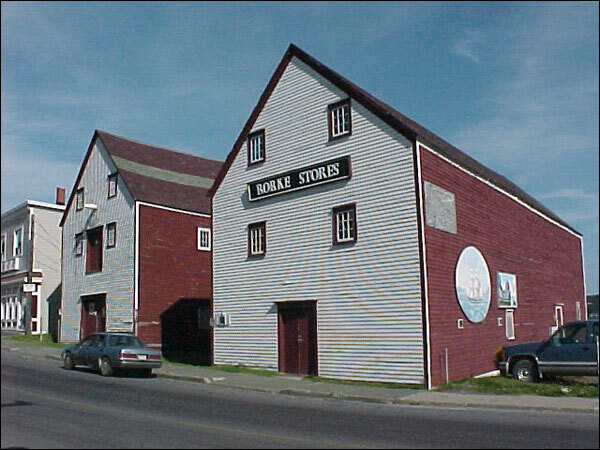 Until 1999 the Rorke Stores were among the best preserved examples of mercantile premises on the island. The visually imposing two-storeyed wooden structures could be seen from numerous vantage points in Carbonear. The eastern, 1917 store collapsed in a wind storm in 1999. The building was carefully disassembled, with each piece numbered and tagged. Following the collapse of the one store, the older, western store was fully restored and now operates as a museum. The Rorke Stores became Registered Heritage Structures in February 1988. Also view the Rorke Store Registered Heritage Structure on the Heritage Foundation of Newfoundland and Labrador web site. The Newfoundland and Labrador Heritage Web Site has on its site only a portion of the registered heritage structures in Newfoundland and Labrador. To view a complete list or search for a particular structure visit the Heritage Foundation's Property Search page.